With installations in hundreds of countries, Sage 300 ERP is truly a global product. With technology breaking down borders, it has become commonplace to see companies of all sizes conduct business internationally. But if you’re asking yourself “How does Accpac address the requirements of so many different accounting rules, currencies, languages, and cultures,” then read on to learn about the international appeal and diversity of Sage 300 ERP. First and foremost, it’s worth pointing out that Sage 300 ERP is developed, designed, and supported by a diverse team that hails from all corners of the world. Sage believes strongly that a software product ultimately reflects the team that builds it and the Accpac folks truly reflect a diverse, innovative, and “world-wise” group. Easily manage global commerce across multiple companies or subsidiaries. No matter where you do business, maximize your international insight and exchange information worldwide with Sage 300 ERP Multi-Company and Global Operations Management. Sage 300 ERP allows you to install multiple languages, each of which is assigned per user. In other words, you can have an AP clerk running Sage 300 ERP in Spanish, a warehouse manager running French, and accounting staff running English. This might come in handy for companies that have branches or divisions in several countries. 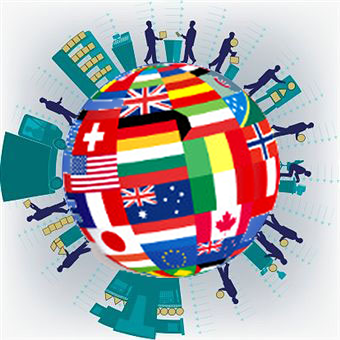 Out of the box, Sage 300 ERP supports English, French, Spanish and Chinese. From Pesos and Pounds to Euros and Yen, Sage 300 ERP Multi-Currency provides automated currency conversion while allowing you to maintain an unlimited number of currencies and rate types. Sage 300 ERP also supports up to 3 decimal places and 18 digits (15 before and 3 after the decimal - more than most competing accounting products offer!). And with a centralized table of all exchange rates, you can use the power of automation to keep track of ever-changing currency valuation. The development team for Sage 300 ERP is also mindful of various regional settings that include things like date preferences (mm/dd/yy vs. dd/mm/yy), characters used for number formatting (decimal vs. comma), currency symbols and much more. And when it comes to localization, the configuration options and flexibility of Sage 300 ERP can accommodate the nuances of almost any jurisdiction. So rather than providing Australian, Canadian, and American versions of Sage 300 ERP to accommodate the respective sales tax laws, Sage 300 ERP is available in one version that boasts a sales tax engine that’s powerful enough to tackle just about any local sales tax law you’ll encounter. If suddenly you find yourself doing business internationally but haven’t yet taken advantage of the global diversity of your accounting software, don’t hesitate to Contact Us for assistance and discover why Sage 300 ERP is truly a global product.